This screenshot shows the cover of the latest Knight Commission report. That’s a good thing. Here are 10 ideas for how we can make this a reality. While journalism has a tradition of fierce competitiveness, the current state of local journalism finances and the importance of the mission warrant a fresh look at how entities can work together to inform the public. 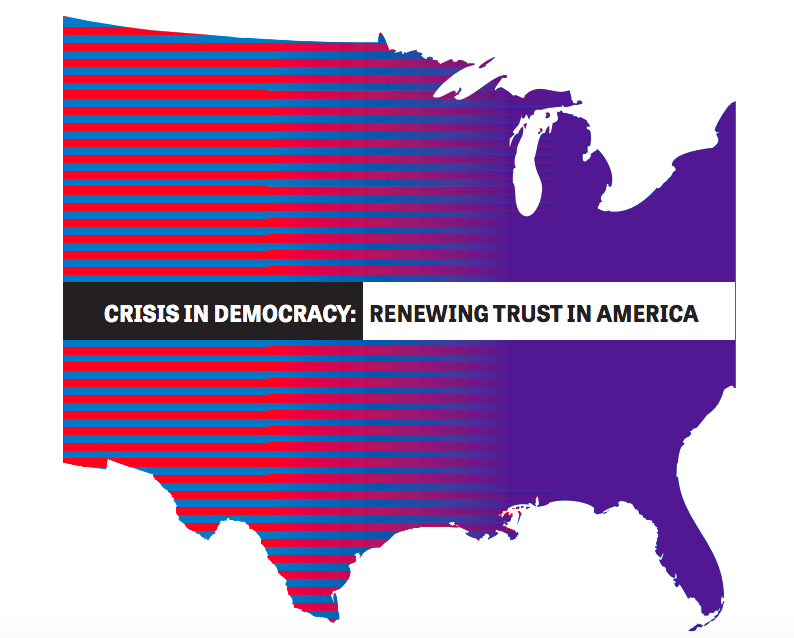 This screenshot from the Knight Commission on Trust, Media and Democracy’s latest report shows the area where collaboration was recommended. Collaborative journalism can help news organizations produce and provide the kind of news and information that just isn’t possible when everyone is working within their own silos. It can increase diversity, reach and impact. Partnering more national and local public broadcasters, an expansion of the regional collaboratives that have been successful for the Corporation for Public Broadcasting. Encouraging other national and local collaborations. Investing more local and national philanthropic dollars to support collaborative projects. These are fine ideas, but they only scratch the surface of what is really needed. So, let’s dive a little deeper into how collaboration can benefit media (and especially local news ecosystems) and what else might be needed to spur successful efforts. Think about the powerhouse kind of journalism that could be done if, for specific impactful, meaningful projects, some of the biggest national players joined forces. Now think about how amazing it would be to see large news organizations from across the political spectrum work together — think Univision working with The Washington Post — and what that could do for the spread of factual, actionable information in the U.S., and what it could do for trust in media. These kind of national-to-national collaboratives are becoming very common around the world during elections, thanks to rigorous fact-checking initiatives led by First Draft. Outside of elections, we don’t see this kind of partnership very often, although we can point to some 1:1 nonprofit collaborations (ProPublica and The New York Times) and some 1:1 television/newspaper combos (a joint ABC news and Los Angeles Times investigation). Not only could more national-to-national collaboratives produce high-quality journalism at scale, it could also spur copycat collaboratives at smaller, local news outlets. That’s in part because local news orgs often take cues from the large industry leaders, and seeing successful collaboratives at that level could help normalize the practice. This is a high hurdle, but there are many potential topics that could lend themselves to a national-to-national effort. A U.S.-based fact-checking effort around the 2020 elections — which has been under discussion for some time — could be game-changing. While this sounds counter to the notion of improving local news, many of the biggest and most complicated stories we are trying to cover are directly tied to the United State’s position and relationship with the world. Part of what makes collaboration powerful for newsrooms is that it enables us to cover stories with wide-ranging impact. This is particularly true for stories that go beyond our borders — immigration, tax shelters, privacy laws, the implications of global tech platforms, misinformation and climate change. Collaborations across borders are how we avoid building intellectual walls that prevent us from understanding our complex connection to the rest of the world and how we avoid othering people and news from the rest of the world. As part of this work, we’ve started translating our resources into other languages, starting the the Collaborative Journalism Database which is now available in English, Spanish and Portuguese. This month at the International Journalism Festival, we’ll be hosting a workshop about the opportunities of collaboration around the world. As Christine Schmidt of Nieman Lab has recently begun documenting, local television is still averse to collaborative journalism. We see this often as we talk to folks who run collaborative projects around the country: They approached the local TV station but were either turned down or not acknowledged. Local TV leadership often cites fierce competition as the reason why they’d never work in partnership with another news entity. It’s also true that local television hasn’t seen the kind of extreme pressure on its business model that has ravaged newspapers. Yet. But involving local TV is critical, as television is still one of the most common ways that people get local news. Those of us who promote collaborative journalism need to do a better job reaching out and involving local TV in conversations about potential projects, and do a better job explaining the value proposition. Incentivizing more one-on-one collaborations — pairing a TV station with a news nonprofit, for example — and then touting the results will help. The more that TV outlets see their peers collaborating and getting good results, the more willing they will be to join a partnership themselves. This is where programs with large trade organizations like the National Association of Broadcasters could help. Collaborative journalism can have a major impact at the local and community level, especially for ethnic media outlets and very small independent shops. But funding is hard to come by, and most local news outlets don’t have extra money to initiate and execute such projects on their own. I saw this first-hand in 2017 when, thanks to Democracy Fund and Rita Allen Foundation, the Center for Cooperative Media funded seven local collaborative projects. We received more than 70 applications from all over the U.S., and many folks told us that the funding we were offering ($7,000) would have made the difference between the project being executed and being shelved. The bottom line is there just isn’t many places that small, local collaboratives can go to raise money to help get a project off the ground. Some family and place-based foundations do this level of funding, but not many; and most of the larger foundations prefer to fund larger collaboratives. Local sponsors are another potential vehicle, but that avenue needs a lot of ethical consideration and planning. I’m talking about small grants — awards of between $500-$5,000 — to seed meaningful collaborations that could lead to longer-term, impactful and sustainable efforts. This is one area where we are (thankfully) seeing some growth: support for local news ecosystem collaboratives. These are formal or semi-formal efforts that are ongoing and typically not based on one project alone. The benefit to establishing a collaborative is that is makes a huge difference in building long-term, trusting relationships between media partners, which leads to good collaborations in the public interest. There are collaborative efforts in several U.S. cities and states, including in New Jersey, Detroit, Colorado, North Carolina, San Francisco, New Hampshire and more. One of the most alluring draws to joining a collaborative project, for many news organizations, is access to pooled data or a data editor. Those news outlets that are lucky enough to employ data editors, or database reporters, are sitting on a goldmine of potential collaborative projects. If more news orgs with data skills partnered on their work, the impact could be dramatic. Not only could it expand the datasets, in some cases, and add additional people to help search the data for stories, but it also could diversify the reporting and greatly scale the reach of the end results. I hear often from reporters who have large datasets they can’t compile, clean and explore by themselves, but I rarely hear from news orgs that have large, cleaned datasets that they are willing to share. We saw this recently when NJ.com released The Force Report and encouraged other local news outlets to dig into it, and ProPublica has always been great about sharing its datasets; so has the Center for Investigative Reporting/Reveal and WNYC. But overall, this is an untapped area. Audience engagement is an important facet of the industry today, but much more could be done to double down on engagement and turn it into direct collaboration with communities. I’d argue this kind of work is indeed a form of collaborative journalism, as the best projects often involve multiple media entities working hand-in-hand with individual community members or local community groups. It’s the type of work that City Bureau does in Chicago (and has recently helped seed in Detroit), as well as what the Listening Post Collective fosters in the cities it works in. Even for the most experienced collaborators, technology gets in the way. Many of the collaborations we’ve studied put together several different systems in order to get their work done: An ad hoc (and usually not incredibly secure) combination of Google Docs, email, platforms like Airtable and more. That’s why investing more in technology that supports collaborations could help; it will remove an unnecessary barrier. Platforms like Project Facet (disclosure: Founder Heather Bryant freelances for the Center and I’ve helped advise Facet) and ChannelX exist to address this problem holistically, and then there are initiatives like ProPublica’s effort to build and share a tool similar to what they used for Documenting Hate that will make a difference. News nonprofits are fantastic collaborators. Building on the early success of ProPublica’s Local Reporting Network, I’d love to see that model — or something like it — expand to other nonprofit verticals. Any way we can give capacity to some of the biggest nonprofit news players so they can do more collaborating will help. 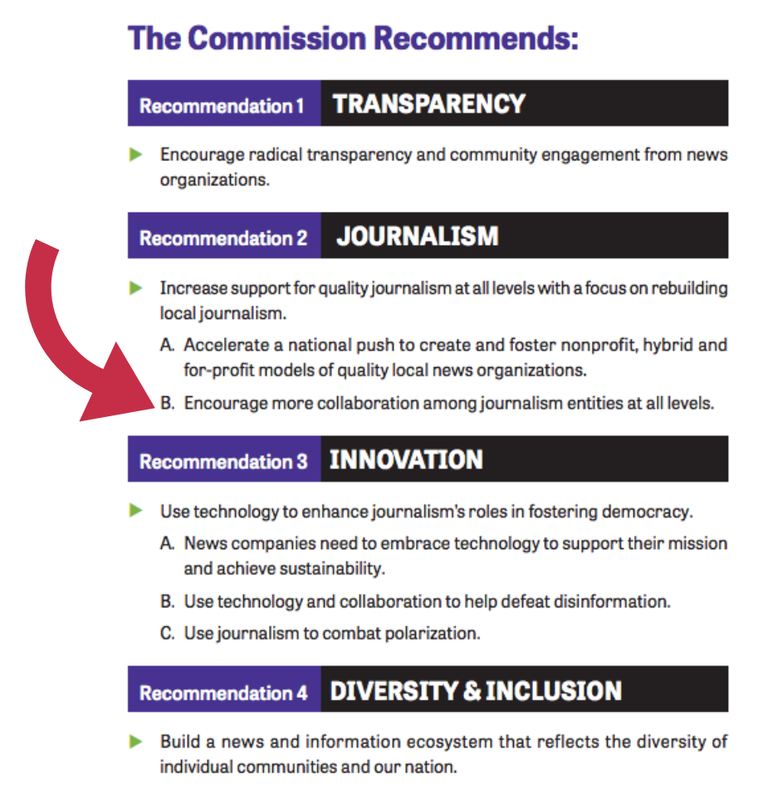 Kind of like the Commission’s recommendation for public broadcasting, but for news nonprofits. So this last point is admittedly self-serving, as this is the kind of work the Center does. But more research into collaborative journalism and its impact is needed, as is more knowledge-sharing, case studies, events and training. The industry is only beginning to wrap its arms around collaborative journalism, in much the same way that engaged journalism has come to be common practice over the last decade. These kind of resources will help ensure we learn from each other and help newsrooms make informed decisions as they pursue collaborative efforts in their communities. Want to learn more about collaborative journalism? You can subscribe to our collaborative journalism newsletter for more updates and information and register for the 2019 Collaborative Journalism Summit. And of course, we invite you to visit collaborativejournalism.org to learn more about the topic of collaborative journalism — including our database of collaborative journalism projects.